I don’t typically like discussions on a topic that start with an etymology lesson or definitions, but as I started thinking about the collaborative aspect of collaborative decision making, I really found myself having to give some consideration to the meaning of the word because it wasn’t immediately apparent to me exactly what everyone’s talking about, other than the basic idea of working together, when the word gets thrown around. So I’m making an exception despite my misgivings and exploring the definition. Turns out the word is pretty interesting and nuanced. When we talk about working together within an organization, collaboration includes the ideas of being jointly accredited or rewarded and recognized. When it is between different organizations the nuance includes usually, though not necessarily, willing cooperation, and also the idea of partnering outside your ordinary circle of connections. This first dictionary definition represents the positive connotation I believe is intended by the typical use of the word in most organizations and business environments today. As in; Let’s collaborate on this article, and get it completed faster. Note it doesn’t say how to work together. Interestingly though, this second definition seems to describe something like the atmosphere around the experience of many people I talk to in my work at Decision Lens. To cooperate treasonably as with an enemy occupation force in one’s country. As in; If you collaborate with the enemy, you will be executed. In fact the French word collabo (collaborator) was often coupled with the adjective sale (dirty) and considered a supreme insult. So this got me thinking about that “water tight distinction” mentioned above for this idealized and desired positive form of collaboration, which is what prompted me to come up with the new spelling – “Collaberration” in the title. Because in my experience it is rare, and simply not the norm. We often hear talk, in lofty terms, about working together to achieve a common goal in ways that conjour images of a Koombaya singing Utopian organization where productivity effortlessly expands. If we’re honest we would have to admit that when this happens it is an aberration. But it does happen on occasion. Conversely in the worst cases, while often well intended at the outset, hidden motives, personal agendas and reluctant compromises that are kept from the light of day, can create passive aggressive behaviors that can result in coalitions of the unwilling feigning cooperation while actively resisting progress. There’s nothing like a dose of this dysfunction to significantly undermine decisions and stifle real progress against goals. If you believe that words have power (which I do) it’s interesting that we’re using a word (collaboration) that is loaded with baggage and inferences to the very kind of behavior I think many are hoping to weed out by evoking it. Which makes me think perhaps collaboration isn’t always necessarily the objective. It may be a desire for alignment, cooperation, or maybe even more so, outright submission. I know I have been in some environments where unconditional surrender seemed to be what was being asked for under the guise of collaboration. So why is it so difficult for us to get people to work together and make decisions to advance their objectives? I’ve noticed that my various standing alerts and feeds for Decision Making and Collaboration, tend to bring forward stories from Sports & Politics for the former, and the Arts and Academia for the latter, almost every single day. These human endeavors seem to in some way help define the concepts in our minds, or at least have the most demonstrable examples where the language fits. I’ve touched on decision making in sports in past posts, and so thought I would look to the arts for a bit more inspiration and insight into collaberration. I found the video below, and thought it a wonderful example of a group of artists/athletes working together to do something no one of them could do alone. Now, while we don’t know their back story, or the personal intrigue or their group dynamics there are some thoughts it provoked that I’d like to summarize in tandem with what we’ve read above. Fascinating. Beautiful individual contributions and simply amazing teamwork. So if it is collaberration we want, with all of the messiness that comes with it, here are 5 key considerations that can contribute to enabling the kind of creative, and productive environments where it can take place. These ideas are interdependent, and self reinforcing of each other. Vision & Purpose: In the case of our video, no one member of the troupe can achieve the vision. A single person can propose the concept of a group shadow puppet (perhaps to a reaction of some laughter initially), but teamwork is needed to realize it. There has to be a compelling and inspiring purpose to get people to reach beyond the limits of self, a purpose that stems from a vision that aligns their self interests and individual contributions to mutual benefit and achievement of the group objective. Transparency & Tolerance: For our artists, there is nowhere to hide as they contribute to the silhouette on the screen, their contribution to the whole and the ability of that contribution to advance the objective has to be open and visible. There MUST be a desire and tolerance for Transparency in collaberration, no matter how difficult and uncomfortable. Transparency enables members to respectfully dissent, express and resolve differences in opinion and build alignment (i.e., agreeing to disagree and move forward in a unified direction) This allows investment in the purpose, to achieve commitment and allow members to operate above board. Creative Conflict: We can be sure that there is argument amongst our artists and directors about the optimal configuration of appendages to create wings, wheels and triggers. Conflict is inevitable, and necessary. We should assume we will be challenged by the ideas and perspectives of others whatever the position we, or they, hold in the group. Disagreement and contradiction are a source for creative solutions. 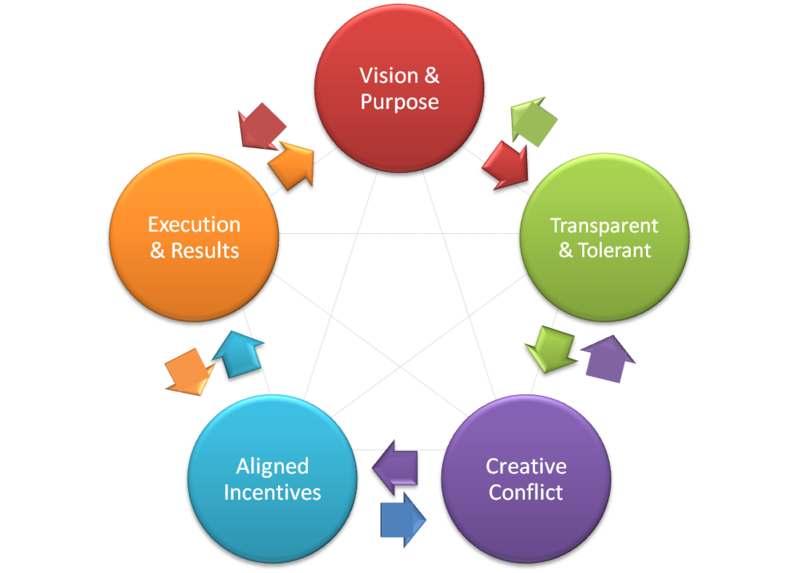 Compelling Purpose and the tolerance for Transparency can help sustain the group through the conflict. Incentives & Alignment: If our artists are given the incentive to stand out from the group, they will likely undermine the cohesiveness that creates the composite effect of their work. Individual incentives can not undermine the group purpose, and need to be crafted in a way that aligns rewards and/or recognition with unique individual contributions that are clearly enablers to the group’s goals (i.e., those kinds of contributions the group would agree “we couldn’t have done it without them”). Transparency and purpose increase, and conflict decreases, the better this is done. Execution & Results: If our artists believe in the vision, are given the incentive to advance the group objective in a way that is enabling of productive conflict and promotes transparency, they can create a stunning collaberrative result. The end goal is to “work together” to produce something extraordinary; an outcome or product. The execution and coordination necessary to achieve that desired result are most likely a byproduct of the points above, whether deliberate or circumstantial, and execution would be difficult as a goal in and of itself. Breaking through the barriers of competing interests, beliefs, perspectives and motivations is a challenge that is not easily solved. Please join in the conversation and seize the opportunity to collaberrate to better understand how we might achieve more positive and breakthrough experiences in the process of decision making within groups. It would be great to hear about the experiences of others in achieving collaberration.